It has only been a couple of weeks but I miss the Netherlands already. If anything can be said about the Dutch, it is that they are "nice." Yes, nice. The single most ambiguous adjective in the English language, but in this case, devilishly specific.They are nice. They are also tasteful, often extremely so. The the hidden benefit of being a touring musician: you get to know places that would otherwise probably have passed by. Like Tilburg, a small textile trading town that is home to a University and the scene of the Tilburg International Gypsy Festival. Having done several tours of the Netherlands in the last decade I can honestly say that I see no great reason to stay in Amsterdam, and that eating in Holland is like eating nowhere else. Which is to say, you can eat well and cheap, but not necessarily in restaurants. I’m sure there are good restaurants in Holland, but the ones I have been treated to tend to be pricy and bland. Indonesian and Surinamese places are widespread and entirely assimilated into the Dutch national cuisine, but in truth the national food seems to be various forms of fast food: gyros, felaful, pizza, and even hybrids like the mysterious “Kapsalon” – a frightening mess of doner kebab meat, fries, cheese and mayonnaise topped with salad that was featured in a recent column on the award winning Istanbul Eats blog. Then there is Febo. Anybody who has ever staggered home late at night drunk in Holland knows that glowing sign offering solace and fried goodies to late night stomaches in search of edible solids. And that is pretty much what Febos offers. Febo is a chain of automats, self contained and nearly robotic human feed suppliers that offer coin operated little doors to open and a nearly fresh hamburger or croquette comes out. And apart from the fact that nearly everything is deep fried or of the hamburger tribe, it is actually quite fresh and healthy. Kroket is a very Dutch food that, obviously, has not traveled much outside of the borders. Originally a French croquette, it is a roll of beef with thick gravy breaded and fried. Basically, leftovers fried. These are sold everywhere, especially in “Snakbars” where you can have a dozen different varieties of things on sticks deep fried for you and then slathered in mayonnaise sauces. When you look at this, you are looking at what food of the future will look like. Scary. But not bad at all. But there is yet another Dutch favorite that vies for the title of Unhealthiest Food in Holland, and that is the humble Flemish frites and saus. Tilburg is in the Brabant region, a mere ten kilometers from the Belgian border, and is culturally and linguistically a part of the Flemish continuum, and that includes the thing we English speakers have erroneously labeled the “French” fry. They should be known as “Flemish” fries, but by now nobody really cares who mastered the art of the twice fried frite and who discovered the mayonnaise saus, it is the cheapest thing around when you have no idea what to eat and you do not want to shell out EURO 4 for another stick of fried mystery meat. When you get to the south of Holland or the north of Belgium you begin to notice that the festival backstage staff are often comprised of hugely fat people, frighteningly mutated Belgomorphs and Flemonsters who grow to legendarily immense size on a diet of frites, mayonaisse, and trappist beer. Which, at music festivals around here, is what is for lunch! The Dutch, however, do have a few real delicacies hidden up their sleeve. It is not all hothouse vegetables and cans of white sauce. Cheese, for one. It is everywhere, and it is always good. Good Dutch Gouda cheese, either “jonge” or”oude”, is a pleasure and still made by hand in small artisanal farm operations. And everybody seems to have a cryopac sealing machine on hand just in case you wish to travel with your hunks of perishable local cheese. We bought a couple of good chunks from a cheese dealer in Tilburg who gave us a lesson in local cheese (“try this… and try this one… now taste this one…”) We learned that a huge wheel cheese is the mark of a good cheese, because the farmer is confident that he knows exactly how long it takes to age and ripen. Factories can’t take that kind of risk with their product, so their wheels are standardized and smaller. There was an aged Gouda with a crystallized texture like that in parmesan cheese that was unforgettable. And while they have a long seacoast and an active fishing fleet, the Dutch don't really have a rich tradition of cooking seafood. They have excellent fresh ingredients for it, though, and good smoked fish - including eel - is widely eaten. The Dutch have a wonderful way with herring: nieuwe harengs are halfway between sashimi raw fish and a fermented pickled fish. Doesn’t sound good, does it? But it is. Boneless, mild and meaty, they are unlike any herring you may have tasted, and it seems that shipments of Dutch herring are finally making it to New York and the City of Foodies is going wild. The best ones you can get are in the open markets and served with a bit of chopped onion – you hold them by the tail and drop them down into your mouth. They pop them in a bun for the national sandwich, as well. And Fumie made her big discovery: Dutch pastries and cookies. Especially almond cookies. Every nation in Europe has one sweet baking specialty in which it surpasses all other competitors. The French win at baguette and croissant. The Hungarians win at pastry and scones. The Germans know how to bake cookies, and the Italians win for apple tarts. But the Dutch win the prize for anything made with almonds, especially ground almonds. For some strange reason, they simply do not know how to make a decent loaf of bread. Most Dutch I asked will admit this openly. They have a dozen types of bagged soft white bread or varying shades of the kind of sandwich bread we know all too well in the USA as “Wonder Bread.” When we stayed here on tour we used to drive across the border into Belgium to gas up (cheaper) and buy bread (better.) You would know you had crossed the border into Belgium because immediately the bike lanes would disappear, the roads would start on the street crumbling beneath you full of pot holes, and there would be piles of stinking garbage left out to rot. Oh, and the missing children posters on the bus stops. No, we would be very happy to return to the Netherlands, who were bursting with pride for their team’s efforts to place in the Euro Cup football finals. The town was all decked out to support them, but they lost all three matches to Portugal, Germany, and Denmark, the so-called “Death Group” consisting of the best teams in the league. Even the Tilburg tennis shop faced the EU Cup match wears Holland's Orange colors with ironic aplomb. 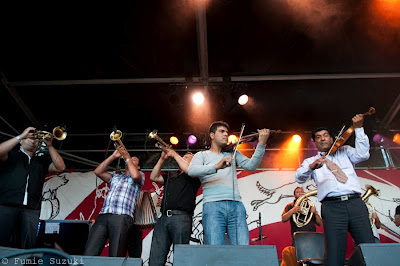 Gypsy Festival in the Netherlands! Been home a week since playing the International Gypsy Festival in Tilburg, Netherlands. 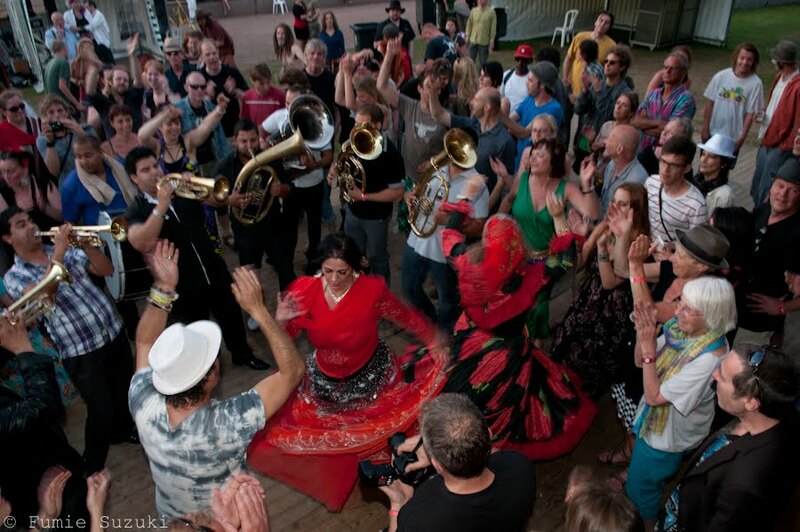 The Festival is one of Western Europe's best venues for Gypsy bands getting together for a long weekend of music, culture and dance organized by Albert Siebelink's Stichtung Kultoer music agency, based in Tilburg. 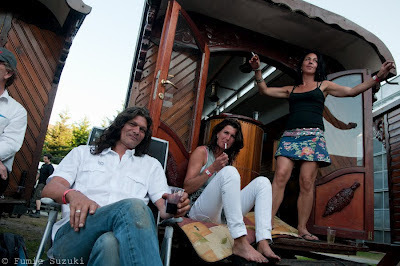 Over the years they have toured many of East Europe's best folk and Gypsy music acts around the Low Countries and have a lot of experience dealing with the particularities of working with Gypsy musicians on the road. And working with local Gypsy communities, Albert has been able to promote a sense of cultural inclusion that would be welcome in the frighteningly anti-Gypsy political atmosphere we presently have here in Hungary. It all added up to a seamlessly organized festival, a great and enthusiastic crowd dancing outdoors in downtown Tilburg. 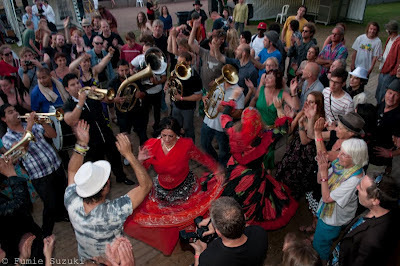 The main festival was on Monday - Pentecost, a holiday known as "Pinkster" in the predominantly Catholic southern Netherlends - Taraf des Haidouks and Kocani Orkestar, as well as Olah Vincze's band and Lajko Felix from Serbia, and Amparo Cortes' flamenco inspired project from Spain, Temperamanto Gitano, which featured the violin of my old friend Tcha Limberger. Tcha is a Sinto Gypsy from Belgium who came to Hungary in the 1990s to learn music. 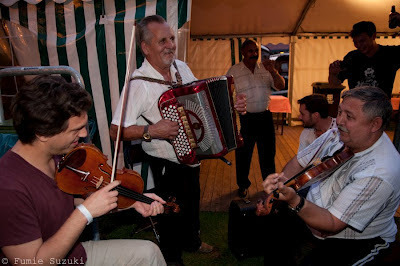 He apprenticed under master fiddlers in Transylvania like Netti Sannyi and picked up the virutostic style and repetoire of the Kalotaszeg region. For the last few years Tcha has also been working with Alan Bern's Yiddish Summer Weimar program teaching Gypsy music and theory. 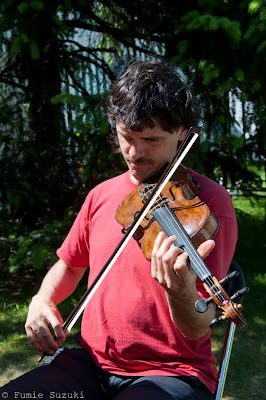 Born blind, Tcha is something of a genius, speaking at least a dozen languages (including several dialects of Romani, Hungarian, and Romanian) and playing Gypsy fiddle in a number of styles. When Yuri the drummer from Manyo met him he listened and then said to me in Hungarian "It is a pity he's blind." to which Tcha piped in fluent Hungarian "No, I can hear well enough!" Backstage you could hear musicians from all over speaking in Hungarian, alongside Romani, Serbian and Romanian. It was like we had never left home. Special thanks to our friends Hans and Vera for putting Fumie up and taking good care of the band, and to the Rom Baro himself, Albert, who managed to produce a festival of outstanding quality while facing a year of health concerns. As we say in Romani "T'aves but sastipe!" May you have much health!